"By taking classes at ArtWorks, my son is able to really focus on specific art media techniques and get feedback on concepts like color and composition that he wouldn't get otherwise." ArtWorks is a place for everyone. We are a rich and dynamic community of developing artists of all ages and skill levels. Each student is unique, and each one has his or her own story. Some of our students draw all the time and want nothing more than to create art. Others are here because they have felt that they are not “good artists” and they want to be able to draw and paint realistically. Some students want assistance in preparing a portfolio. Many of our students have had an interest in art that, until now, they had never pursued. Whatever the situation, we look forward to meeting and working with each student. If they have an interest, ArtWorks will supply the rest. We offer our students ongoing enrollment, year-round, and mentor relationships with exceptional teachers. It is not uncommon for students to remain enrolled with us for years. Our program is designed to grow with the student and to offer new and exciting challenges as he or she progresses. Each new experience offers an opportunity to further develop as an artist. Our students enjoy having their work shown for public view at our studios twice a year. Through our display program, 120 students are represented each month. These displays offer great inspiration and are a wonderful way to gain greater insight into our programs. We hope that you will stop by to see what our students are doing! Our students have also had the opportunity to exhibit their work in the broader community. ArtWorks has had the pleasure of having significant exhibitions throughout the history of our studio. We always seek new opportunities for our students to display their work and welcome offers and suggestions for display opportunities from the community at large. 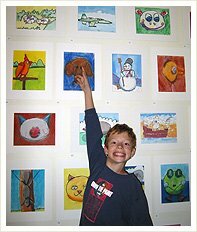 It is magical to see the pride each student feels standing next to his or her artwork on display. It is so gratifying for them to hear the praise that inevitably comes from having others view their work in a formal exhibition setting. Twice a year since 2002, three of our students are recognized for exceptional dedication and a high level of achievement in our program by being named an ArtWorks Master Student. Carefully selected by a strict set of criteria, this honor represents accomplishment, commitment and longevity. Each recipient is honored by having a selection of his or her work displayed at ArtWorks for six months. The Master Student displays have provided all our students with inspiration and encouragement. Everyone enjoys viewing this work and learning something about these young artists, their goals and their experience at ArtWorks. We invite students, their families and visitors to view the current Master Student displays the next time you enter our classrooms.